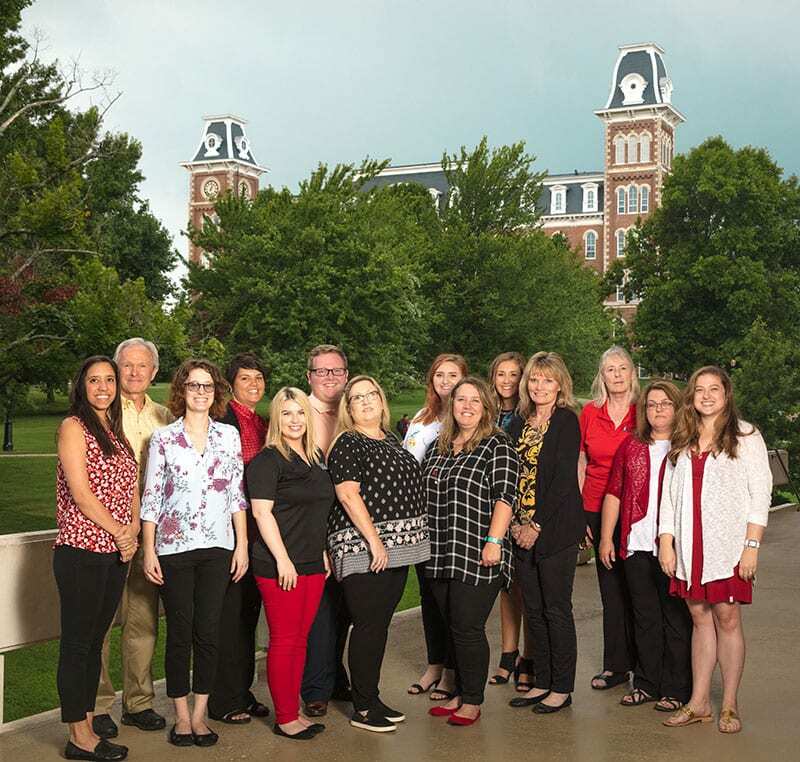 The OASIS team, from left, Ana Barker, Doug Talbott, Erica Langley, Elizabeth McKinley, Madelyn Jones, Matthew Fey, Stephanie Gragg, Julia Smith, Katie Winkler, Bailey Younger, Cindy Folsom, Deb Henderson, Denise Bignar and Laura Tilley. 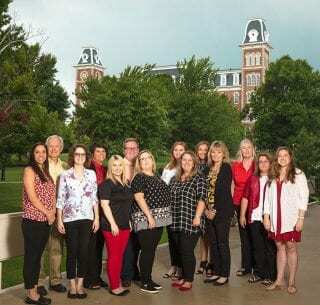 The College of Education and Health Professions at the University of Arkansas has created a new office to streamline student services, naming it the Office of Academic Student Initiatives and Services, or OASIS. Advancing student success is one of the university’s guiding priorities in its strategic plan. The office creates a coordinated, systematic, and intentional design and implementation of student success initiatives at the college level. OASIS brings together current advising and student support resources and identify and implement additional interventions, early-alert programs, and targeted student success initiatives. It will serve about 4,000 undergraduate students during their entire undergraduate enrollment, from matriculation to graduation. The office is housed in newly renovated space on the third floor of the Graduate Education Building. The main office entrance is Room 350 of the Graduate Education Building. Elizabeth McKinley was named to the new position of director of academic student initiatives, effective July 1. She will lead the advising and student success initiatives in the new office and promote a culture of student engagement within the college. McKinley formerly worked four years as an academic coordinator in the RN to BSN degree program delivered online in the Eleanor Mann School of Nursing, also part of the College of Education and Health Professions. McKinley also worked as admissions counselor at John Brown University in Siloam Springs and a university transfer specialist at NorthWest Arkansas Community College. Denise Bignar continues in her role as director of academic student services. She coordinates student records, registration, reporting, and degree clearance and assists with curriculum changes and program modifications. Matthew Fey, the assistant director of the college’s Honors Program directed by associate professor Michelle Gray, continues in that position, which will be integrated into OASIS. A career counselor position, held by Madelyn Jones, was added in collaboration with the university’s Career Development Center, and an assistant director, Ana Barker, was appointed from among the academic advisors. The other advisors in the OASIS office are Cindy Folsom, Julia Smith, Doug Talbott, Laura Tilley and Katie Winkler. Bailey Younger was recently hired as an undergraduate student recruiter who will work in collaboration with the Office of Admissions. Deb Henderson and Erica Langley, the two academic advisors for the nursing program, and Larry Aslin, faculty advisor for communication disorders, are also part of the OASIS team, but they remained in the Epley Center for Health Professions, where the nursing and communication disorders programs are located. An administrative specialist’s position, held by Stephanie Gragg formerly of the Office of Academic Affairs, completes the OASIS staff. Kate Mamiseishvili, associate dean for academic and student affairs, oversees the Office of Academic Student Initiatives and Services. OASIS unifies the training and professional development of academic advisers while strengthening opportunities for faculty mentoring by allowing faculty mentors to focus their time on research, professional, and career mentorship of their students. For more information, call 479-575-4203 or email oasis@uark.edu. Advising appointments may be made through UAConnect.